So, this week I’ve had an ant problem. I know, I know, it’s not really something to blog about, but while ants probably fulfill a wonderful purpose OUTSIDE of my house, I really don’t care to have them sharing my home with me. So, I’ve been deep cleaning and making sure that there would be no “legitimate” reason for them to decide to move in with me. In the process, I found some old Air Wick and Febreeze wall inserts that I forgot I had and decided to buy some more scented vials for them. I was so excited because they have some of the fall scents out already and I absolutely adore fall! Which reminds me … I know I’m rambling … but forgive me this side note. 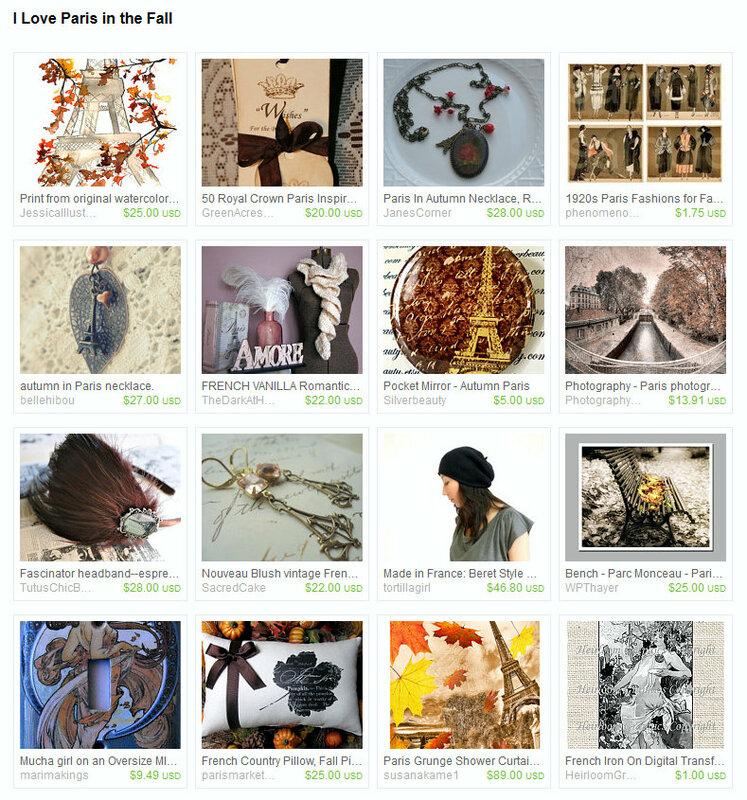 I made a Treasury on Etsy called “I Love Paris in the Fall” that I’m pretty dang proud of. Here is the picture of it, and if you click on the picture, you’ll go straight to the treasury. It was such a joy to highlight the work of other wonderful artists and craftsmen/women, without expecting anything in return. Okay, so let’s get this train back on track. How much joy and beauty are we missing out on when we don’t tap into all of our senses? Not only around us, but on us as well. So, I want to focus on the sense of smell today. Think about the special memories in your life … are there smells attached? I love fall, as it makes me think of crisp leaves falling, the smell of football games with hot dogs and peanuts. I love the smell of leaves burning. I love the smell of apple pie and cinnamon. It reminds me of a homey warm feeling. When I think about things that I adore, I often think about the smells that come with that thought or feeling. Okay .. so let’s move on to your environment. How does your home smell right now? If it doesn’t smell inspiring, or beautiful, then how can you feel inspired or that you’re in a beautiful environment? 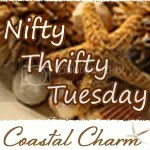 You might want to think about the smells that inspire you or relax you, enliven or invigorate you. Do you have the appropriate smell in the appropriate room? If you want to relax in your bedroom, you probably don’t want to potpourri in there with eucalyptus (known for its invigorating properties). If you have a work out area, you don’t want to have chamomile and lavender in there, because you’ll go to sleep before you finish your push-ups. As to smells and which ones do what, here’s a wonderful link for you to learn more, it is the <a href=”http://www.aromatherapy.com/”>Aromatherapy</a&gt; website and has a ton of information about which scents do what. With that being said, I also read a very interesting article that stated that if you have a bad association with a smell, then it doesn’t matter what the properties of that scent is, it isn’t going to produce the effect that you want. Because our memories of smells can overcome the effectiveness of a smell in and of itself. So let’s go to the beauty aspect of smells. Do you know what smells work best on you and your system? Have you ever noticed that someone can be wearing the very same perfume as you, and it will smell completely different on them. It is amazing how are body chemistry works with a perfume to create a unique blend or fragrance. If you ever have the opportunity to go to a Perfume store where there is actually someone who truly knows what they are doing, it is quite an experience, and one that I think all women should do at least once in their lives. You will learn so much, and at the same time, realize that you have probably wasted a lot of money on perfumes that really weren’t right for your body chemistry. 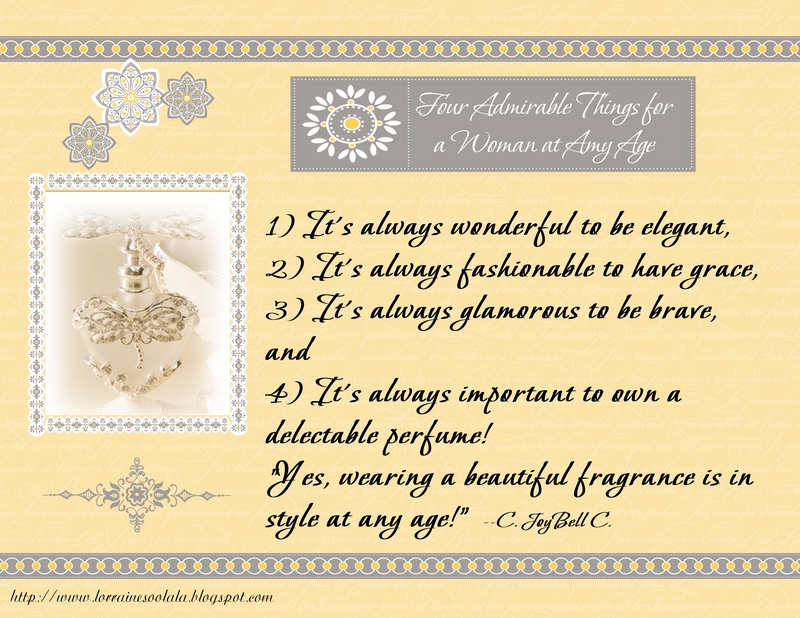 So, let’s get to the bottom line … do you have a special perfume that is just yours? That is you … that is everything about you in a nutshell? One that isn’t the hope that you’ll become like the model on the television commercial, but one that characterizes you and your own unique beauty? If not, then I think it’s time that you took the time for yourself and found out what your perfume should be! I’ve had several perfumes that I’ve loved over the years. And, now that I’m in my late forties, I have found that some of the old favorites, don’t really “speak” to me like they used to. I think that my life has evolved and so my perfume choices have evolved as well. I found MY scent a year ago. It is Angel by Thierry Mugler. So, my challenge to you today, is to take the time to think about your perfume … does it reflect who you are, right here and now. If possible, go to a perfume store, or at least a perfume counter where someone truly knows perfumes, their top, middle, and low notes. Someone who will know what questions to ask you so that you can find “your” scent. I promise you, you’ll feel so beautiful when you are wearing … well … you, in a scented form! So, here’s today’s Freebie Friday. I hope you enjoy. I first found a quote by Coco Chanel that says: “A woman that wears no perfume, has no future.” However, I’m wanting to inspire, not tell you there’s no hope! So, I think this one is a little more promising!! As always, it is not for mass production or to be used for profit in any way. You may download your full copy by clicking on the picture and then right clicking to save to your computer. Of course, you may send as many people as you want to my website to get their own copy. Bonsoir Mes amies … Have a wonderful weekend! !